The peddler stopped his cart and climbed down from his seat. "It's a fine day,' he said. "Truly," answered the little man,"and that's a fine bed you have there in your cart." In this tale of kindness and giving, a peddler attempts to sell a fine, handcrafted bed, guaranteed never to squeak, to a poor man who has no bed at all. But the peddler's heart is moved by the man's generosity when it's time to get back on the road. Listen to a recording of the story done by the DeWitt Community Library in DeWitt, New York here. The library offers a program to kids called Reader's Theater. The kids read a story, with each child reading a different character's dialogue or reading the narrator's part, as if reading from a play. For an in-depth Teacher's Guide for The Peddler's Bed, visit Marcie Colleen's website. Besides writing picture books, Lauri Fortino works as a library assistant in her local public library. She has a degree in Library and Information Services. She is a strong supporter of library and literacy initiatives. She features a weekly Picture Books At The Library listing on her blog, Frog On A Blog, which also offers book reviews, author/illustrator interviews, and teacher's resources. She enjoys spending time with her husband Chris and their dog Java at their home in Syracuse, NY. To read more about Lauri, click here for an in-depth profile. A self-taught artist, Bong Redila grew up in a small town in the Phillippines where he, as a kid, used to daydream about making paperplanes as a full-time job. Now grown up and a full-time husband and father living in Miami, FL, he daydreams about flying on a paperplane. To read more about Bong, click here for an in-depth profile. In the world of comic books and graphic novels, many dominant themes center on stark realism, socio-political-economic commentaries, historical events and personalities, violence, science fiction, fantasies, and particularly right now, superhero. How about stories catering for our beloved very young children? 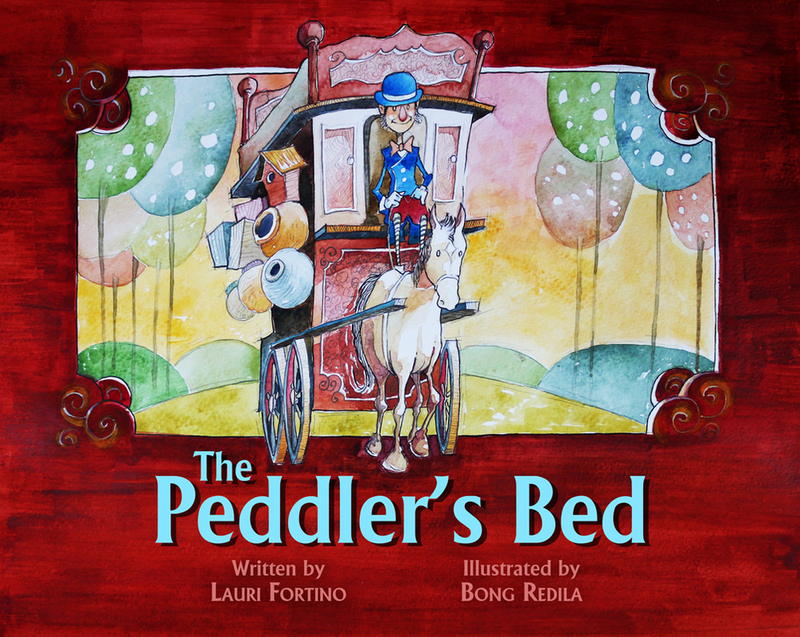 Sure, there are a couple of these and one of these gems is the creation of Lauri Fortino and our very own Bong Redila who crafted a very eye-popping, entertainingly, and yet, simple visual narrative in The Peddler’s Bed. First and foremost, The Peddler’s Bed is as simple as it gets. It is a children’s graphic novel—simple, easy-to-read, colorful, oozing with positivity, and most importantly, must teach children something valuable. There are three characters: the peddler, little man, and a dog named Happy. The peddler comes to the man’s humble home and makes an offer the latter must achieve, if the little man creates a sound on the former’s top-of-the-line bed, he can have it for FREE. Easier said than done, as what the cliché says. But, instead of dwelling to the usual cynicism and other dubious styles of negative storytelling that dominate many comic genres nowadays, Ms. Fortino resorts to the old-fashioned but highly effective narrative that suits to very young children, more so for parents who want to do bedtime storytelling. Additionally, young children should be taught and guided with great values and manners, like respect, trust, generosity, hospitality, and being grounded. The writer actually achieves this objective and our kababayan simply nails those traits that surely create a lasting impression to young readers, as well as a great reading graphic material for every children’s library out there. Naturally, Mr. Redila carries the burden of fulfilling the writer’s tale by executing a very vibrant children’s storybook that even adults can surely love the overall interiors. Colorful it is, and the artist avoids making his colors so bright or so grim, even during nighttime to ensure the consistent feel of warmth and positivity. Sure, one may argue that Redila’s artistic style can be connected to Skottie Young’s highly energetic, playful and childish illustrative trademark. And, in all seriousness, Skottie Young fans should enjoy Redila’s artistic style as well. Redila shows further his good command of sequential illustrative narration that goes well with the writer’s simple yet charming prose. The faces of the characters are quirky and illuminating without any exaggerations whatsoever. On the serious note, I love how the creative team projects of the possibility of molding a type of capitalist who is righteous at heart. I say so for the fact that capitalism is often associated with negativity, particularly values of exploitations and greed, something we want to avoid and/or minimize, to say the least. Perhaps, Ripple Grove Press may contribute something of the dream of a society molded on righteousness without aggravating one’s dignity and trust. As this book is as good as it gets, it is very, very short. Surely, I want more Redila’s fantastic illustrations. Since many comic publishers nowadays cater young parents and even children, like IDW and even Archie Comics. I hope these peoples take notice of Redila’s artwork. And naturally, not everyone would enjoy this, particularly the pessimists and the cynics alike. Consider the latter rant as an asterisk. Who, really, is the peddler in the yellow bow tie? A little old man is watering his garden when a squeak squeak squeak gets his attention. In the distance on the narrow country road, he sees a peddler driving his cart. The old man's dog, Happy, barks in welcome. The old man notices a beautiful bed on the top of the cart, and the courtly peddler, whose blue tailcoat matches his bowler, is happy to bring it down—but the old man hasn’t any way to pay for it. The peddler makes a bargain: if the old man can make it squeak by the end of the day, it will be his. But the bed is so sturdy it never squeaks, unlike the door of the old man's house, his water pump, a field mouse being chased by Happy, and so on. The old man invites the peddler in for a cup of tea and a bit of conversation, giving the peddler a chance to see the extent of the old man’s humble circumstances. The old man is never able to make the bed squeak, but a little kind trickery from the peddler ensures his peaceful rest. Fortino's subtle story of kindness and courtesy features plenty of read-aloud–friendly repetition and onomatopoeia. Redila's palette has the color and clarity of stained glass, and his figures are slightly exaggerated, suggesting Baum's original Oz. What a lovely message of kindness and caring wrapped up in a story reminiscent of an old folk tale! The illustrations are bold, the characters are unexpected. Kids will enjoy the ‘squeak, squeak, squeak’ that all the objects make – the cart, the door, the kettle over the fire. I loved it!